I somehow missed National Margarita Day on February 22 (and I’m super sad about that), so I’m not about to let International Pancake Day go to waste! Although now I’m thinking that I should have invented the margarita pancake…ohhh I have my next brunch adventure planned! Pancake Day is celebrated around the world on Shrove Tuesday as a way to indulge, early in the morning, in super fatty, not-so-good-for-you, decadent food. It’s also a great way to carb up before the partying later in the day (I would love to be in New Orleans right now, sigh). But since I can’t be in New Orleans right now, I guess I’ll just have to cozy up to a tall stack of pancakes! The recipe is inspired by the lovely Gail at Pacific Outpost Kitchen. Gail is lucky enough to live on the island of Maui in Hawaii with her boyfriend Dan and her two cats in a cottage with amazing views. I’m incredibly jealous of her life. So, in order to feel as awesome as a Hawaiian, I live vicariously through her blog! When Gail posted a recipe last week for Coconut Lime Macadamia Nut Banana Bread last week, I knew I had to make. Never mind that I’m not a huge fan of coconut and macadamia nuts are expensive as heck here in Georgia–I had to make it. Conveniently I had some frozen bananas in the fridge waiting to be made into banana bread too. Long story short, I decided to indulge and turn the recipe into a pancake recipe. The end result? Amazing. My mom is anxiously waiting for the recipe as I type. Moist and sweet, without being too sweet, these pancakes make the perfect addition to any brunch. The only things I’d change are rum and lime zest. (i.e. I’d add them.) I mean, what’s better than rum in pancakes? And the lime flavoring wasn’t strong enough just using lime juice, so that’s why I’d add the zest. I don’t want to tell you what to do, but I really do think you ought to make these pancakes for your next brunch. They’re killer! In a small bowl, mix the soy milk with the vinegar. Allow it to thicken for 10 minutes. In a large mixing bowl, combine the bananas, soy milk mixture, lime juice, lime zest, vanilla, oil, and rum. Mix well. Add the dry ingredients to the wet and mix until the batter is smooth. Add the coconut flakes and macadamia nuts. Thin with water as needed. Serve with mimosas and your choice of sides! Ok, now I am blushing from all of the kind things that you wrote (thank you)! 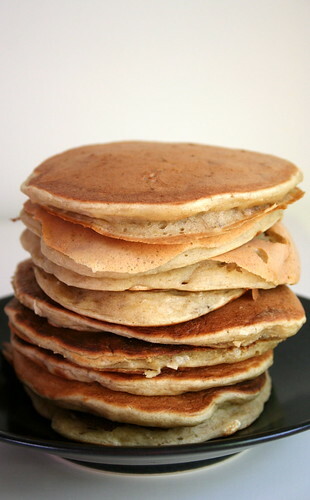 I am also wiping drool off of my computer – those pancakes look so perfect and fluffy! Forget banana bread – I know exactly what I will be making the next time we come into bananas. I cannot believe I missed National Margarita Day!! Your pancakes sound great with the rum and macademias. hooray for international pancake day! i wish i knew earlier, i totally would have made some for breakfast! mmmmmmmmm! never would i have thought to put all that awesome in a pancake. wow! if i make these i’m totally adding rum & lime zest. brilliant! i wish i were in New Orleans for all the mardi gras fun, too! sadface! but these pancakes are making me most happyfaced! w00t! those pancakes sound amazing! i never tried rum in pancakes before, but it sounds like a good idea. wow. just…wow. those sound amazing. Aloha, Jes! Your Hawaiian pancakes sound divine. I’m waiting for Sunday to roll around to make them, maybe with a nice glass of prosecco and OJ. What a beautiful looking stack of pancakes! I love the sound of macademia, citrus zest and rum in this…yummm! Hourrah for Mardi Gras! We’re having a crêpe feast as dicated by years of tradition. I’m not gonna go messing with tradition or anything like that. These cakes look so great – I love Gail’s blog – she’s the best! Those look divine. I love coconut I’ll file this away for a lazy Sunday brunch! Yum, what an impressive stack of pancakes! What a perfect stack of pancakes! And they sound so delicious. Those ingredients would be great in any kind of baked treat. Your pancakes are picture perfect! I’ve got to try this recipe..looks delicious..agree about the rum!